This is the Origin Genesis. I hesitate to call it a desktop; it’s more of a paean to technology, and speed, and excess. The sort of thing that exists (or will exist, in the next few months) just to prove it can be done. Origin has it on display here at CES, and I swung by their hotel suite to take a closer look. We’ve reviewed Origin Genesis machines before. It’s sort of a yearly ritual, timed around the start of the year to pack the latest, greatest processors on the market. They’ll sit at or near the top of the charts until they become a bit less timely, ultimately replaced by the following year’s model. I suspect this one will do the same. You don’t need this machine. But it will run whatever games or applications you’d like, and do so rather well — solid state drives in RAID, four Nvidia GeForce GTX 580 graphics cards, lots of RAM. 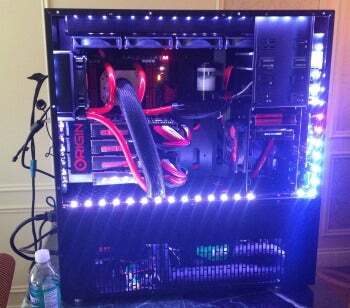 The Sandy Bridge Extreme Edition CPU is overclocked to 5.7GHz. Origin tells me they can get it a bit higher — say, 6.0GHz — but likely won’t be pushing it that far for the well-heeled individuals who order these sorts of machines. See all of that tubing? The new Genesis uses a phase change cooling system. A compressor at the bottom of the chassis liquifies a gas, which is then used to cool the CPU. It’s cold: the LCD panel on the front of the machine read −32.7 degrees Celsius when I snapped my photos. And the reservoir near the top of the case looks a bit like a cauldron of boiling milk, which is neat. Hitting the power button starts the compressor up first, so it can get the temperatures low before the processor roars to life. The PC will detect sudden reboots and the like too, managing the compressor as needed. There’s no final word on pricing, but it will be close to $10,000 — in range of the price on the previous variants of the Genesis I’ve seen. And I imagine keeping the beast fed with electricity will cost you dearly every month. That said, if you’re buying a $10,000 gaming rig I doubt you’ll be too concerned with that utility bill. It’s expensive, and powerful, and gorgeous. But also frightening, in a way. Not so much because of the price-tag — these machines are built to order, so you could theoretically cut that cost in half and still walk away a satisfied customer. I’d be wracked with worry — every time the compressor hums to life, or a game crashes and reboots my machine, or a hard drive makes a funny noise. There’s so much raw, unfiltered power, and complex parts, and tubing; if something went wrong, I’d be mortified at the thought of getting in there and trying to fix it. So I like to think of these monster-PCs as a blueprint. In my mind’s eye, my desktop lies in bed at night, gazing up at a poster of the Genesis and dreaming of a day when it too will have a network of arterial tubing pumping sub-freezing liquid through its chassis. Someday.